What makes learning come alive? When does learning feel whole? How might we better prepare students for work, life and community in the 21st century? In the Guide to Becoming a 21st Century Teacher, we are exploring that central quality which makes learning and teaching come alive and feel whole. The Guide to Becoming a 21st Century Teacher contains background materials, tools and practices to help teachers create a 21st century classroom. You can use this guide on your own, in a teacher working group or as part of your teacher training. UNICEF, Pearson, Mawlamyine University and PointB have been working with hundreds of teachers and adolescents across Myanmar to understand what mindsets, skills, tools and processes are needed to integrate 21st century skills into the classroom. 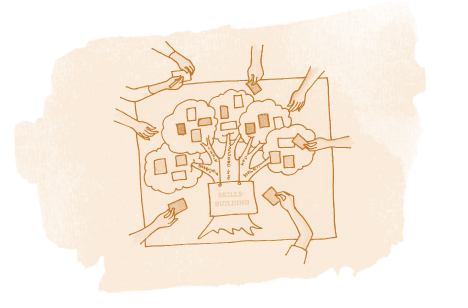 We used a “co-creation process” in which we worked alongside teachers and students in a variety of contexts from formal, nonformal, ethnic, and private school systems. 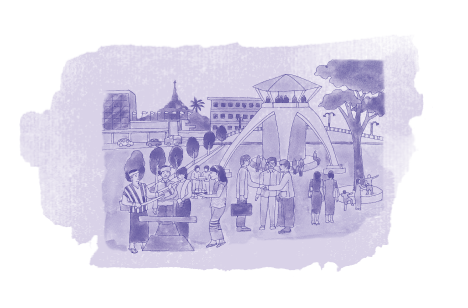 The Guide to Becoming a 21st Century Teachers is a synthesis of those mindsets, habits, practices and processes, which have been proven to make learning and teaching come alive and feel whole in a 21st century Myanmar. How did you hear about the Guide? PointB occasionally sends email updates. Are you interested in signing up and staying in the loop? You are being redirected to the guide download page. Or, click here to be taken directly to the download page. See PointB Facilitator, Naw Tha Ku Paul (Mie Mie), demonstrate some of the key tools and practices included in A Guide to Becoming a 21st Century Teacher. As the name implies a “jigsaw puzzle” can only be completed by fitting different pieces together. Similarly, in the Jigsaw activity each piece of a learning task is essential for the completion and full understanding of the final learning of a topic or concept. “I teach in our community to the ethnic and underserved students, who cannot speak Myanmar language very well and have a lot of learning challenges in school. When I applied the tools and activities from the 21st Century Guide into my classroom, I found that it helped my students to communicate their ideas and thoughts more effectively through small group discussions and visual tools. Now even the slow learners are learning better because the 21st Century tools allow them to learn more quickly and understand concepts more deeply." We would love to hear what you think about The Guide to Becoming a 21st Century Teacher. Let us know what’s been useful, what else you need and how we might be able to collaborate in the future!